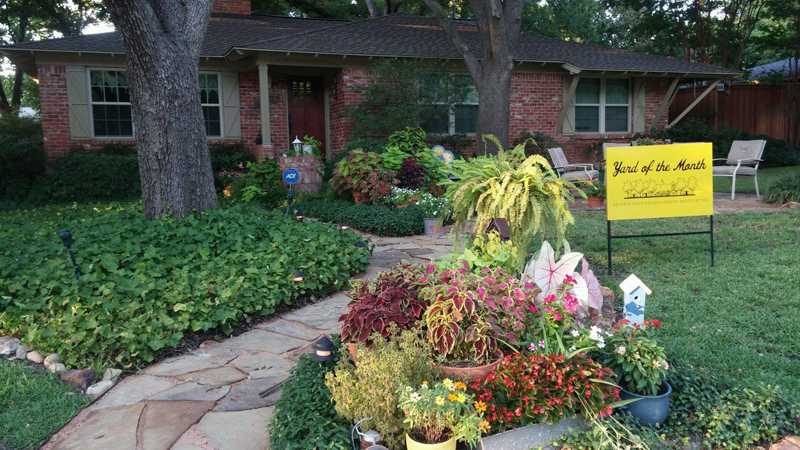 August 2015 Yard of the Month! Thank you so much for the August YOM honor! What a thrill! Our yard has been a work in process. We take our cues from nature. We put in a flagstone walkway years ago because we had a mini creek that flowed from our house to the sidewalk when we had a heavy rain. The walkway stopped the erosion of our yard. The English ivy and jasmine were used to compensate for thin grass areas. We love our big trees and the shade they provide however finding shade loving plants that lend a splash of color was a trial & error process. We’ve discovered coleus, caladiums, sweet potato vines and begonias work great! We also enjoy using impatiens but August heat can really stress them. We’ve recently been putting in a flagstone patio to cover a grass challenged area. We look forward to visiting with our neighbors on the patio! My husband and I love working on projects together & our yard has provided us with many rewarding projects!